I want to get a Meyer lemon tree. This was the first year that I found Meyer lemons in the stores near us, the first year I could actually cook and bake with them, and I’m ready to have a tree or two. I understand that my experiment may fail, but after tasting the lemons and everything I’ve made with them this winter, I must try. That sweet scent and flavor is addictive. So Michael said he is giving me two Meyer lemon trees for Mother’s Day, which will live in pots outdoors in warm weather and come indoors and stay in the sunroom during the winter. I am so excited! Hey, some girls want fancy jewelry, I get happy over fruit trees. To each her own. The trees probably won’t produce for a year or two, but I will try to be patient and wait for the excitement of the first blossom. 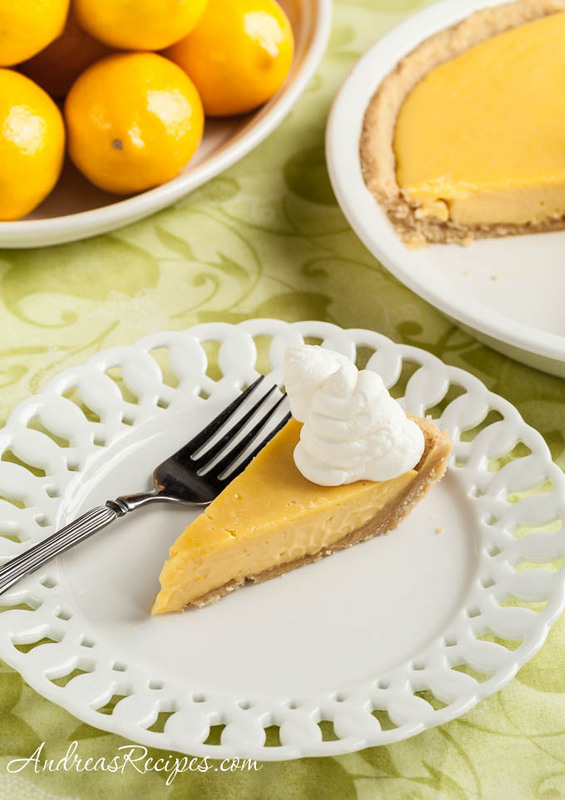 The recipe is actually a riff on our favorite Key Lime Pie recipe, I simply substituted Meyer lemons in place of limes and a shortbread crust instead of graham cracker. I used and recommend Walkers Shortbread Fingers for the crust, my favorite commercially produced shortbread because of the rich, buttery flavor. You can find information on their website about how their shortbread is made with butter from free-range grass fed dairy cows that receive no growth hormones or antibiotics, plus the rest of the ingredients are not genetically modified, and they use no artificial colors, flavors, preservatives, or hydrogenated fats. I appreciate that commitment to quality, and apparently so did Hockey Guy, who said the crust was his favorite part. Smart kid. I made this pie using the fresh free-range eggs from Chrysalis Vineyards, so the yolks are a dark yellow color, which made the pie a gorgeous golden yellow. The flavor of the Meyer lemons works very well, much better than the standard lemons, I think, which would be too tart. The recipe is easy to put together, just have your juicing arm ready. CRUST: Preheat the oven to 350° F/175° C. Break the shortbread fingers into pieces and put them in the bowl of the food processor and pulse until you have fine crumbs. Add the sugar and melted butter and pulse until the crumbs are all wet. Press the crumb mixture into the bottom of the prepared pie plate, pressing up the sides and forming a rounded or squared off top edge. Bake in the preheated oven until golden, about 8 minutes. Set aside on a wire rack and leave the oven on. FILLING: In the bowl of the stand mixer, whip the egg yolks and lemon zest at high speed until fluffy, about 5 minutes. Slowly add the condensed milk and continue to whip until thick, about 3 or 4 minutes. Reduce the mixer speed to low and slowly add the lemon juice, mixing just until combined. The mixture will start to thicken as soon as you add the juice. Pour the mixture into the crust. BAKE: Bake until the filling has just set, about 10 minutes. Cool on a wire rack, then refrigerate. 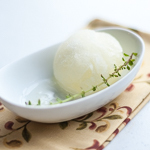 Freeze for 15 to 20 minutes before serving. WHIPPED CREAM: Chill the mixing bowl. 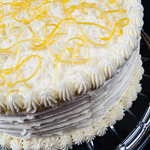 Using the wire whisk attachment, whip the cream and confectioners sugar until you have stiff peaks. Serve each slice of pie with a dollop of cream. My boyfriend get me a meyer lemon tree this Christmas and I was unbelievably excited – way more so than about my other presents! I love it and it’s not that hard to take care of… plus the flowers smell amazing. The one I have is only 3 or 4 years old and already has lots of lemons, so you might not even need to wait that long! Just thought I’d share my fruit tree enthusiasm… cheers! So jealous of the thought of you having a Meyer lemon tree! My brother has one in his yard in California. And although I am not a big dessert eater, this pie has two of my favorite dessert flavors. 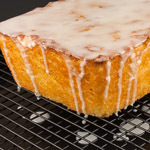 I had a fabulous time making meyer lemon recipes this season! I made the most delicious Meyer Lemon Pudding Cake. I can still almost taste it when I think about it, it was that good! You’re pie looks fabulous! I never realized we could do that with fruit trees around here! That’s it, I’m begging Alan for Meyer Lemon trees for Mother’s Day. LOVE this pie with the shortbread crust!! Hi Katie. It sounds like your tree is doing well, I hope I have good luck with mine. Hi Kalyn. I wish I could plant mine in the ground, it just gets too cold in the winter. Hopefully the trees will like the indoors! Hi Becky. Your Meyer Lemon Pudding Cake sounds delicious! Hi Kristy. I have a bay laurel tree that I put outdoors in the warm weather and bring in for the winter, and it’s doing great. Supposedly the Meyer lemons can do the same. Crossing my fingers! Hi Elizabeth. My blog uses the PrintFriendly service, which allows you to remove all the images and any excess text you want before printing. Just click the green print button near the top, then click anything in the print window that you want to remove from your final printout. You can also adjust the text size to whatever you prefer. I absolutely love your colour palate in these photographs! The pie looks too good to be true as well! This looks interesting.. I will try it out within the next few days for me and my hubby! This recipe looks great! 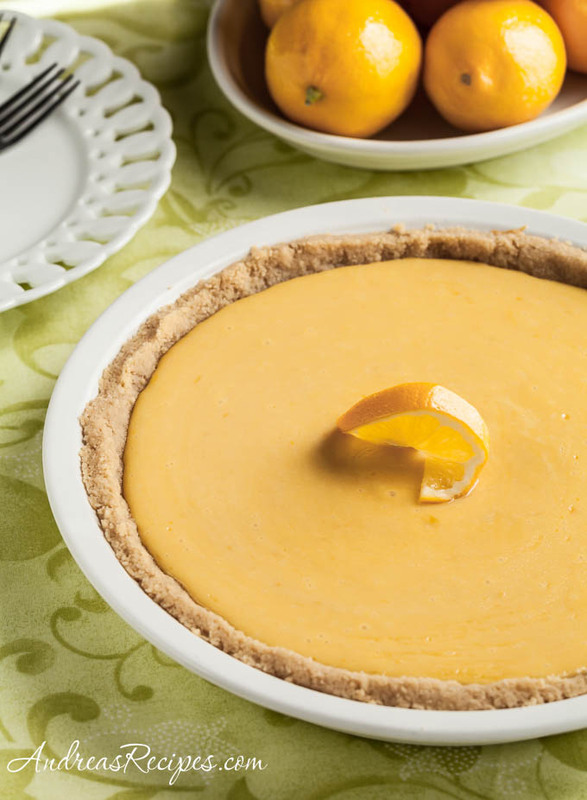 I love anything lemon so I think this will be a great pie to make this summer. Thanks! I’m not usually one for lemon pies, but this looks and sounds really good! Thanks for making this pie while you were here. It was WONDERFUL!! !